A rendering of the building planned for downtown Worcester. WORCESTER — More than a year after it first agreed to lease space in the stalled CitySquare development, disability insurer Unum Group has again committed to the downtown project by signing a lease with CitySquare's new developer. 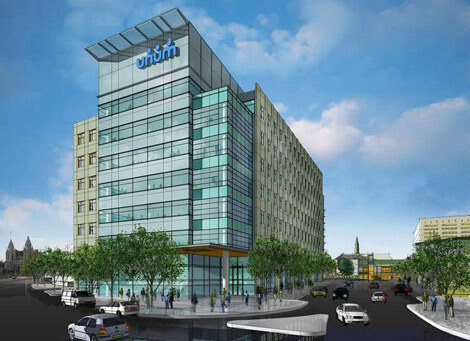 Unum today signed a 17-year lease of a 200,000-square-foot building that will be constructed on Foster Street, said J. Christopher Collins, senior vice president and general counsel of Unum US, a segment of Chattanooga, Tenn.-based Unum. The lease includes parking garage space for 860 vehicles and was signed after five months of negotiations between Unum and the project's new developer, CitySquare II Development Co. LLC, which is financially backed by an investment arm of Hanover Insurance Group Inc. of Worcester. "We're really happy," Mr. Collins said today after signing the lease in Boston. "We sent a note out to employees which essentially says it's a great day for the company and a great day for the community at large. That's the way we really feel." The agreement raises anew hopes that construction on the CitySquare project may soon begin. The project was first proposed in 2004 by Boston-based Berkeley Investments Inc. as a mixture of housing, offices and retail space that would stretch across 20 acres of redeveloped property on the site of the shuttered Worcester Common Outlets mall. But there has been little visible progress since then. With the lease signed, the project is back on track, according to District 2 City Councilor Philip P. Palmieri, whose district includes the project area. "It's for all intents and purposes putting a period at the end of the sentence, and we are off and moving forward with Unum signing on the dotted line," Mr. Palmieri said. Berkeley Investments proposed CitySquare as a $563 million project, including about $93 million in public money for new streets and infrastructure. Unum, which is seeking to relocate about 700 employees from its older Worcester offices on Chestnut Street to newer space, signed a letter of intent last year with Berkeley Investments to lease a new building in CitySquare. The building was designed, but demolition of the old mall never started, and the project seemed stalled. Then in January, the new entity, CitySquare II, signed a purchase-and-sale agreement to buy part of the CitySquare area. CitySquare II formed as a development company with Leggat McCall providing development services. The investor in CitySquare II is Opus Investment Management Inc., a subsidiary of Hanover Insurance, a large employer and charitable donor in Worcester. Hanover Insurance spokesman Michael F. Buckley said the company was "pleased the lease agreement has been signed. Beyond that, it is inappropriate to comment until closing on the site." A Leggat McCall official previously said they expected to complete acquisition of the CitySquare site by the end of the second quarter this year, or the end of June. Berkeley Investments is expected to retain two office buildings on Front Street and a parking garage at Foster and Commercial streets. Under an agreement with the city, the lease of a major tenant triggers the release of about $35 million in public money for work at the CitySquare site. City Manager Michael V. O'Brien said he expects demolition of the old mall to begin in "short order" after CitySquare II completes its acquisition deal with Berkeley Investments. "The lease agreement execution allows us now to apply public funding to the project," Mr. O'Brien said. "The checks and balances within the general development agreement require that there be buildings (scheduled) to go up before any public dollars are spent, so this is significant." Lt. Gov. Timothy P. Murray, who was an advocate of the CitySquare project while serving as mayor of Worcester, called the lease one of the most important milestones in the project. "The closing is the next step and the (beginning of the) demolition process," Mr. Murray said. "That's when, for most people, it becomes real and tangible, but this is one of the most important milestone to date." Copyright © 2010 Leggat McCall Properties LLC - All rights reserved.